So, it’s been a long time coming. I finally got a new ride for the 2011 racing season and its’s a beauty! 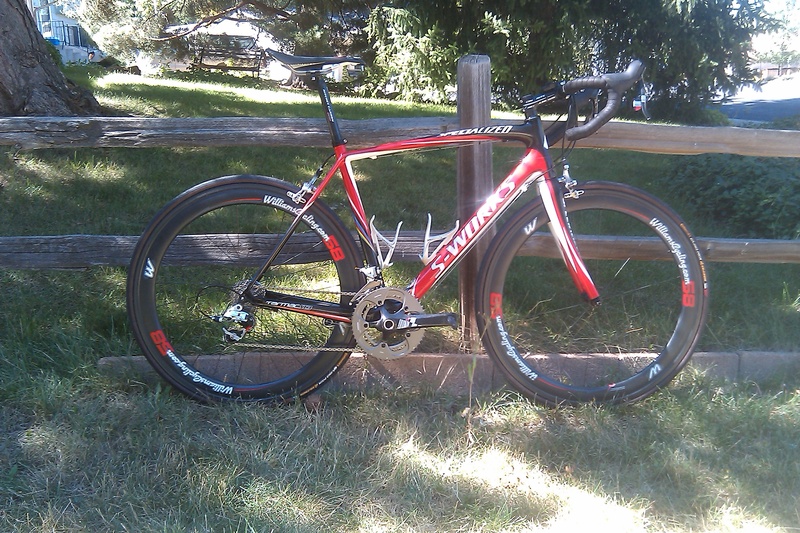 I got a Specialized S-Works Tarmac (56cm) built up with SRAM Red. This bike is light, stiff and a heck of a lot of fun to ride! It weighs in at around 16.3 lb with the my Mavic Aksium wheels, pedals and two bottle cages. This post isn’t just about my new bike, but also the awesome people that do the Specialized BG Bike Fit. In this fit, they use two cameras (front, side) to capture exactly what your pedal stroke looks like in real time. What’s great about this is now they can slow down the video and then it becomes really apparent what sorts of imperfections you have. Also, they do various strength and flexibility assessments. I was quite surprised to find out that I have extremely tight hamstrings as well and IT bands. I’ve never considered these two things to be an issue, but after doing the tests, it’s pretty obvious that they are a weakness of mine. All in all, I walked out with a new stem, saddle (Specialized Romin), insoles (the blue kind) and probably six or seven shims in my shoes to balance out my pedal stroke. Although the fit was pricey, it was well worth it. Today was my first real ride and I can already tell that putting some serious hours on the bike is going to be much more comfortable. What would an update be with a little training update as well? My coach has been, for the last couple of days, sending me out on short rides in order for me to just get the feeling of riding back again. These rides have been super easy and pretty short (30min-1 hour). Next week I start a pure endurance training base and plan to put in about 12 hours. According to my coach, he’s going to ramp up my hours over the next seven weeks culminating in a 27 hour week at the end. After this, I should never have endurance problems again and I can move on to some of my other weaknesses.